My journey with guitars started when I was 15. I, of course, wanted to be a rock star. I already had some musical training, starting with piano at age 6, and moving to saxophone in middle school. I never got excited about these instruments like I did the guitar though. I taught myself how to play with an old garage sale acoustic my Dad had picked up some years before. I practiced it every day after school. It didn’t take long before I was able to play along with many of my favorite songs on the radio. That gratification fueled more practice, which led to more gratification, and more than 2 decades later, I still play nearly everyday. You can listen to me play guitar and purchase my new album “Spectra” here. When deciding what guitar to build, I thought back to when I was 15 years old and playing on a beat up old acoustic. 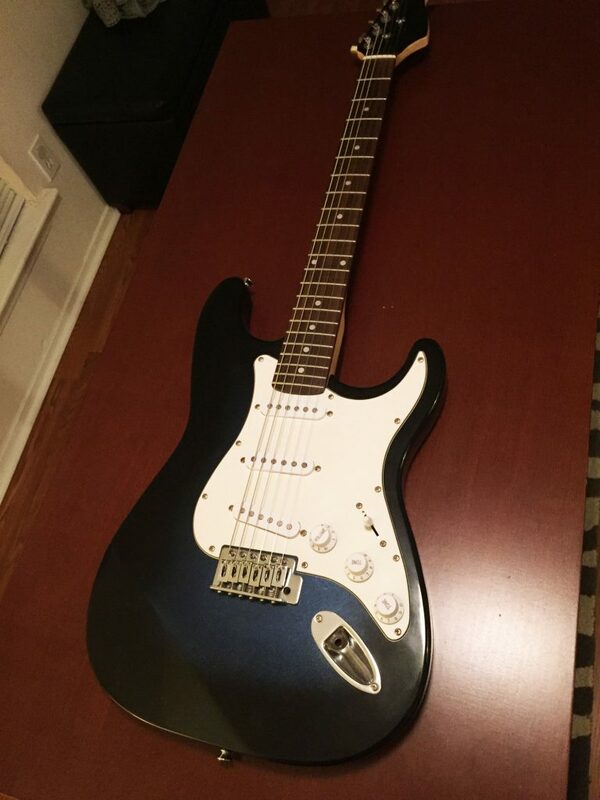 How I wanted an electric guitar so bad! I did get one eventually, after I had sufficiently convinced my parents that I was dedicated enough, but what if I could’ve built my own in school? I would’ve jumped at that chance. This set me on a path to design a guitar project with that kid in mind. 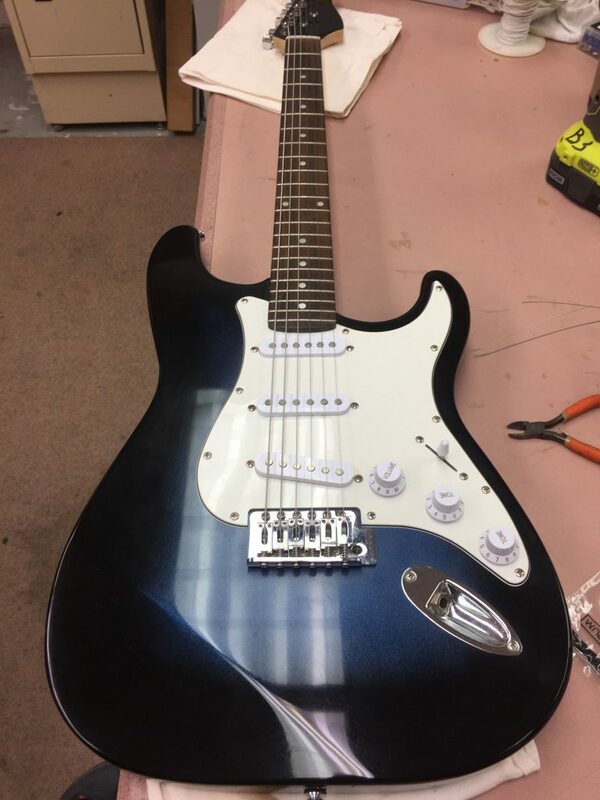 Also, it’s fitting to aim toward the student level project, being a total novice at building guitars that I am. So, in a way, I am still that kid making his first guitar. I call it the Student-Strat. 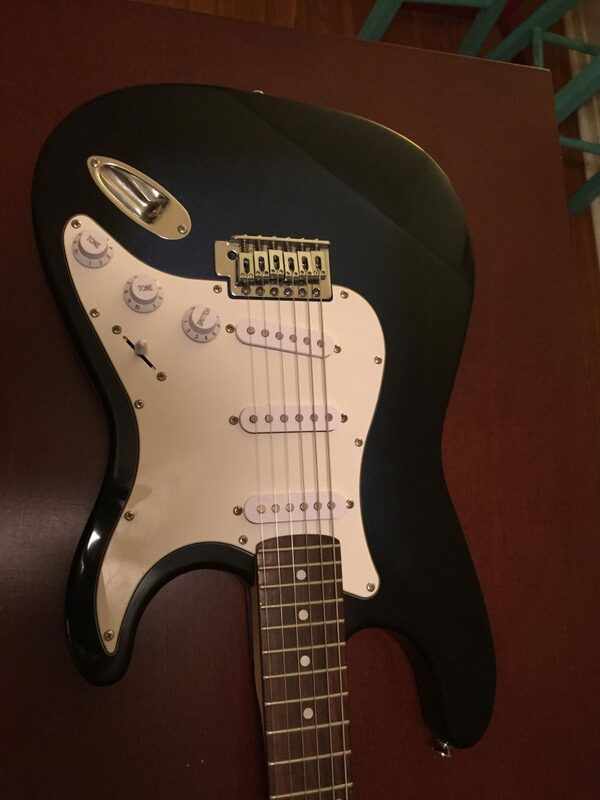 What better design to start with than the iconic Fender Stratocaster. It’s the most copied and sold style of electric guitar ever, so chances are it would be the choice of most. 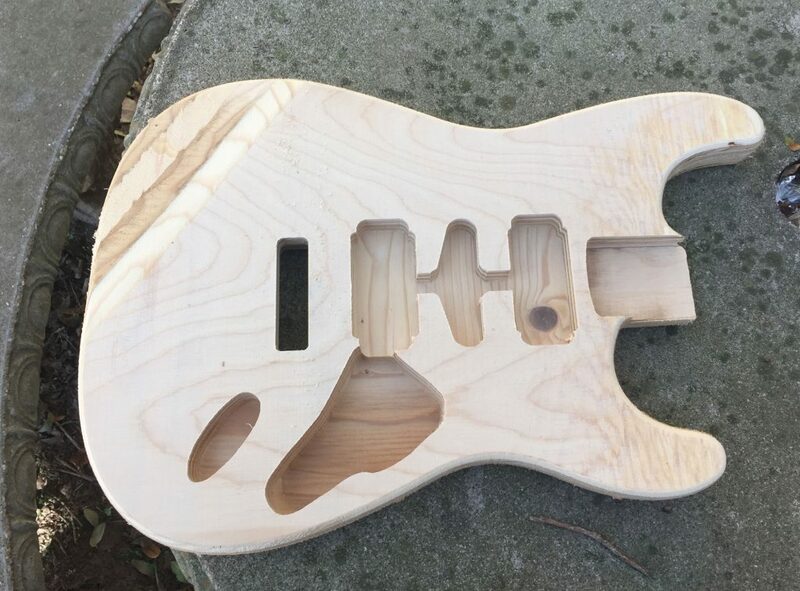 For this project, I didn’t want to try building a neck yet, so this is only the guitar body. Hardware and necks can be acquired many places. Parts can vary widely in price and quality. 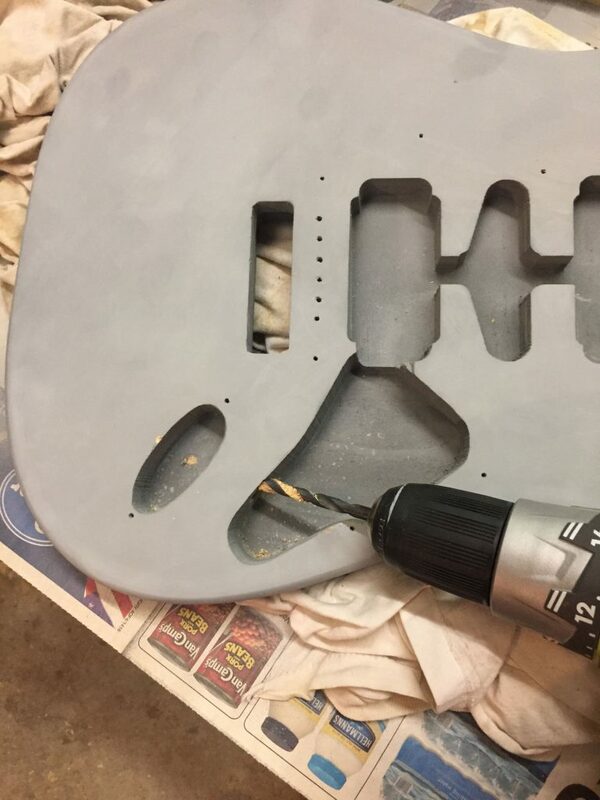 It’s mostly up to the person on what their budget allows, but the quality of the parts will be the biggest influence of the sound of the finished guitar. 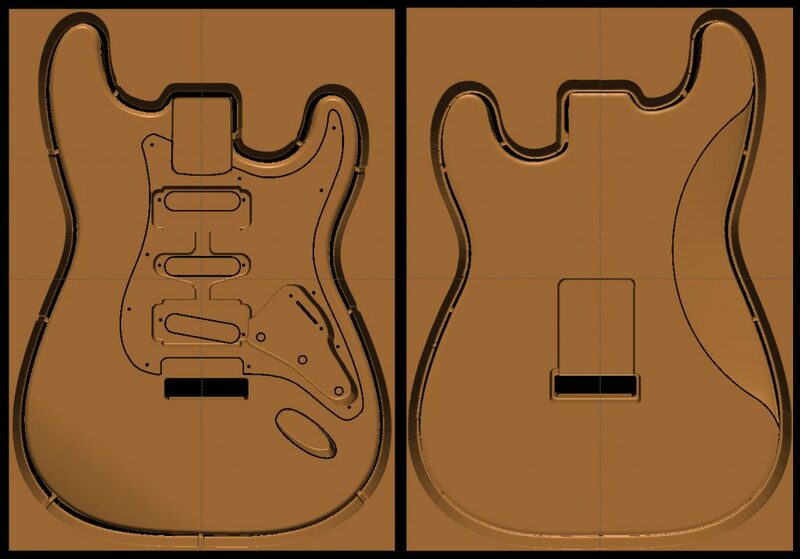 I found guitarbuilding.org a little too late into this process, but this site is exactly the kind of student resource I was looking for. 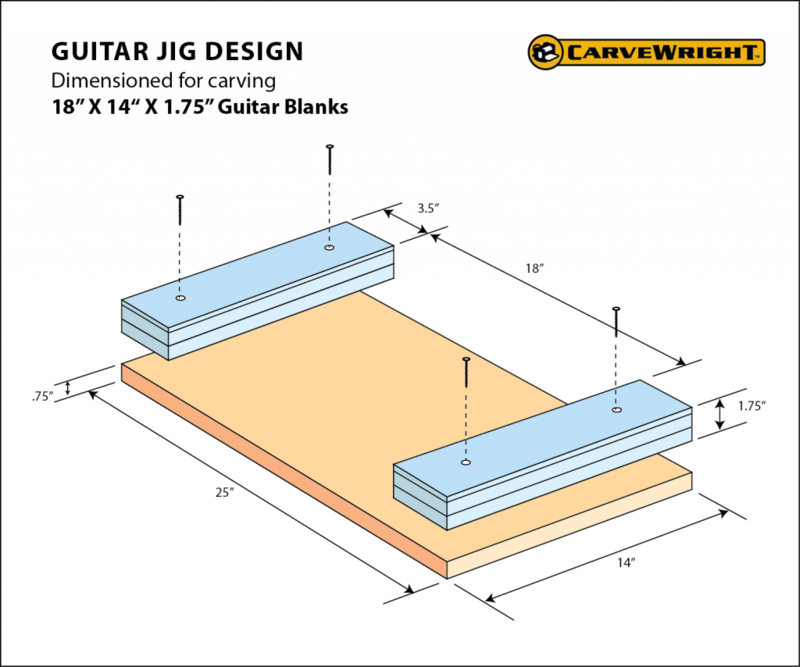 They have excellent tutorials, kits to purchase, including blank boards perfectly suited for the CarveWright. It’s an amazing one-stop shop. If you are a student or teacher looking to build guitars, go to this site for everything you need. 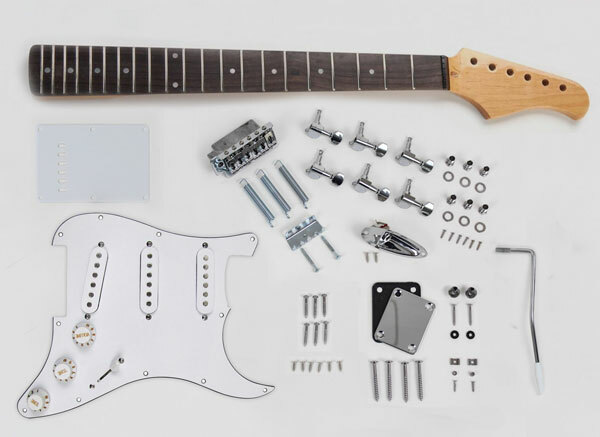 With the style in mind, I ordered my hardware, electronics kits, and strat-style neck. Just like any project with the CarveWright Project Designer Software, there are many starting point options. 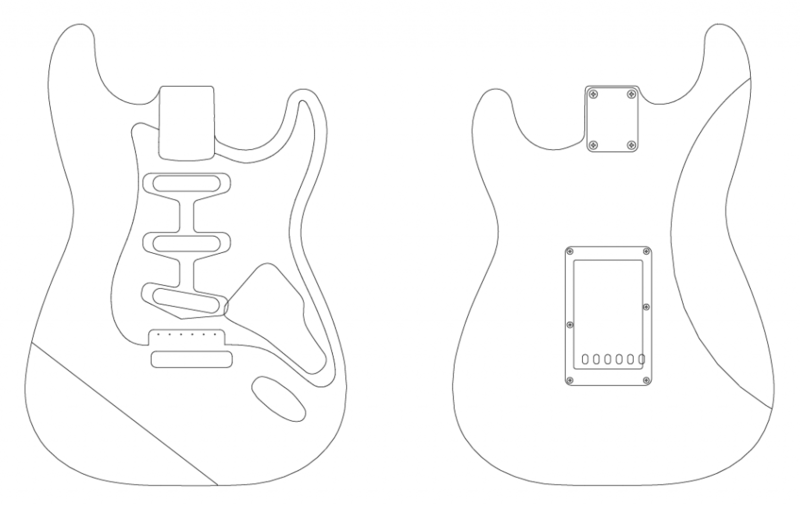 I could draw the design entirely in the CarveWright software either through freehand or tracing, I could find a 3D model already created and import it, I could use the scanning probe and scan an existing guitar, or I could find vector DXF plans and import those. I chose the latter, as there were many plans readily available for download. With the DXF file, I was able to import the design with pockets and everything right into the software at the exact size I needed. Then began the shaping process. I used a combination of a sweep and an extrude merged together to achieve the curves and rounded edges. I also did something that will probably incite criticism from proper guitar builders, but I designed this entire project to use only one bit, the 1/8″ Long Carving Bit. 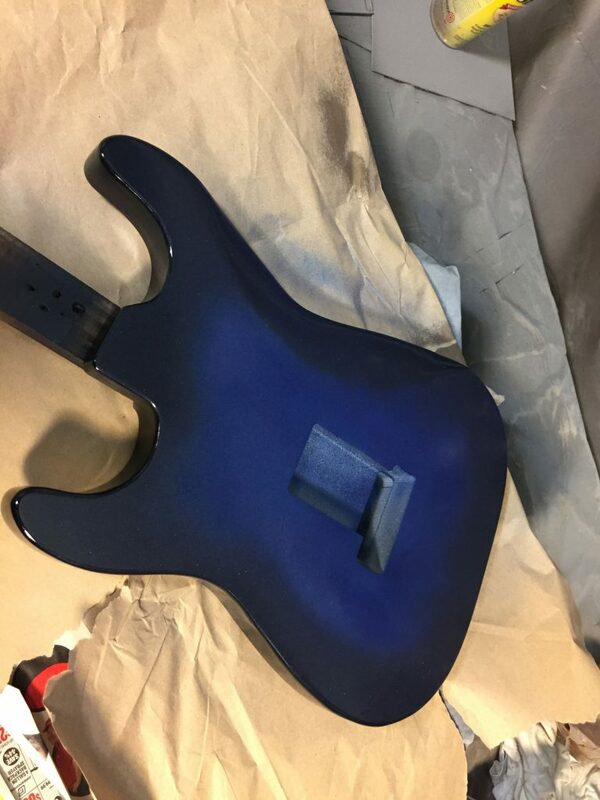 The entire guitar will raster out like it’s being printed. The time to carve this project is just under 12 hours on the Normal quality setting. You might say “that’s a lot of time and I could do it faster with a band saw and a router”, and you would be right. Except, when you look at the possibilities of the kind of detail you can add to the carve. You can add any kind of carved detail you want. 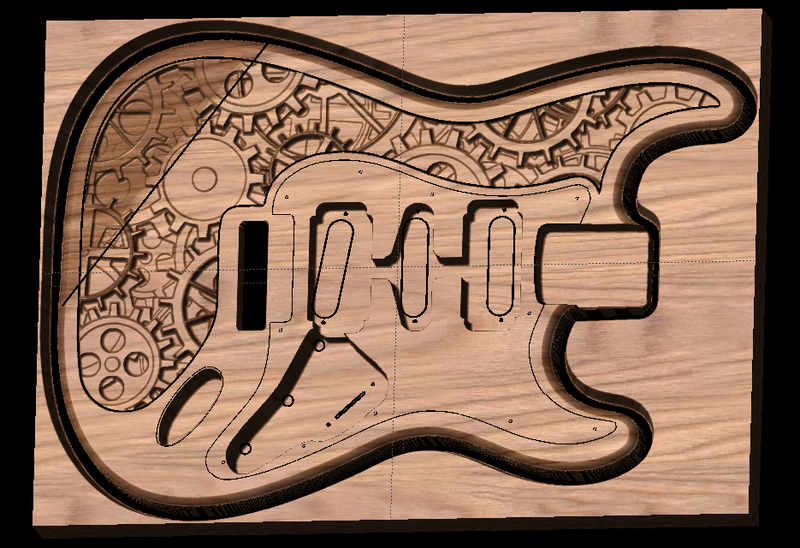 For this first project I didn’t do the gears detail on the guitar, but the “stratpunk” gears version pictured above is included in the Student-Strat Project files. Electric guitars can be made out of almost any material. I’ve seen plastic, carbon fiber, and even cardboard guitars. There is much debate about what woods are best to use for a better tone and sustain. Scientific studies have even been conducted to try to determine this. In the end though, it’s been pretty well proven that, with electric guitars, the material just needs to be solid and it doesn’t really matter what it is. Materials are chosen mostly for three factors: cost, weight, and aesthetic quality. All that being said, this project is designed to be a first guitar, built on a school or student budget, so what material should I choose? I considered many different materials for this student guitar. 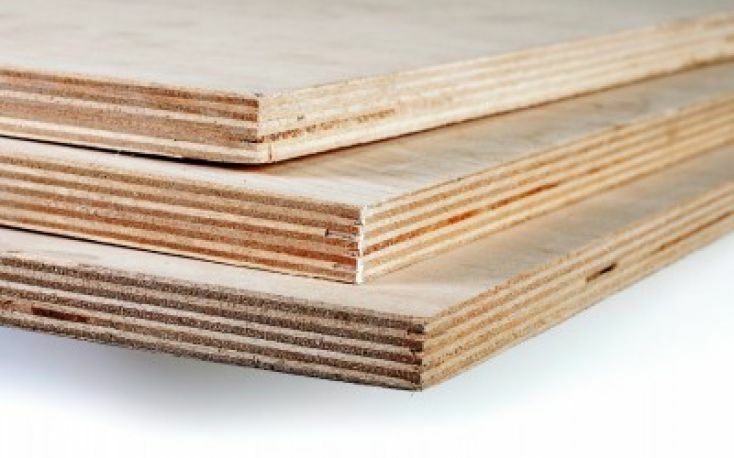 Alder and Ash are the most common woods used for Fender guitars, and Basswood and Poplar are popular with many of the Asian guitar manufacturers. Down here in Houston, all these materials are scarce and shockingly expensive. Another issue is the thickness. 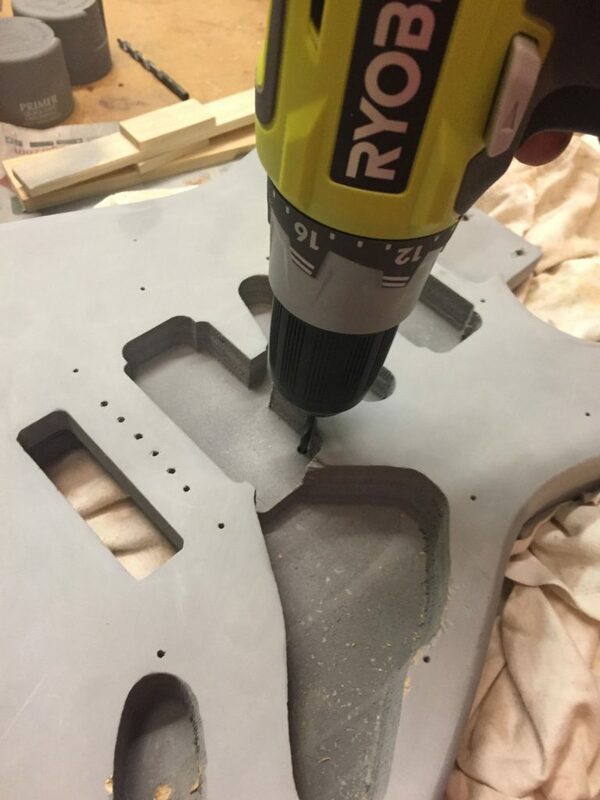 Most guitar bodies are 1 3/4” thick. This poses a much more difficult problem than you would think when you’re on a budget quest. Finished lumber at your local store is generally sold at .75″ thick. 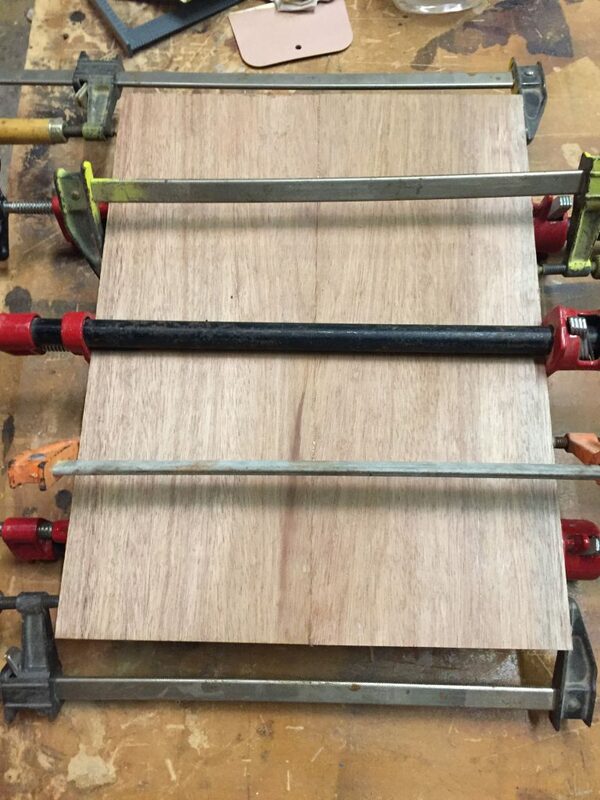 Glueing 2 of these together can get you to 1.5″, but you’ll need another .25″ to get to your total thickness. This doesn’t make it easy, or cheap if you want the extra quarter inch to be solid wood. My mission was to find a universally available and inexpensive material to form a baseline of what can be done with the least amount of money. I found, in my research, that there are many guitars sold on the market actually made of plywood. This seemed bizarre to me, but since I was expecting to screw this project up several times trying to figure out what I was doing anyway, why not use the least expensive material available. Sure why not, makes sense. I totally regretted using plywood later when it came to finishing. No matter the material you choose, it will need to be made into an appropriately sized blank, in this case 14″x18″. For this project, to save on effort and resources, I decided to make the guitar 1.5” thick instead of the 1.75” these guitars are usually. I could just glue two 3/4” boards together and I had my blank. Whether you ordered your blank or are making your own, you need to make sure it is squared up, as perfectly as you can get it. If you’ve read any of my Build blog articles, than you should’ve expected the jig. I make jigs for almost everything I carve. This project is no exception. The jig is going to help us save material, index for 2 sided carving, and be reusable for other guitar carves. 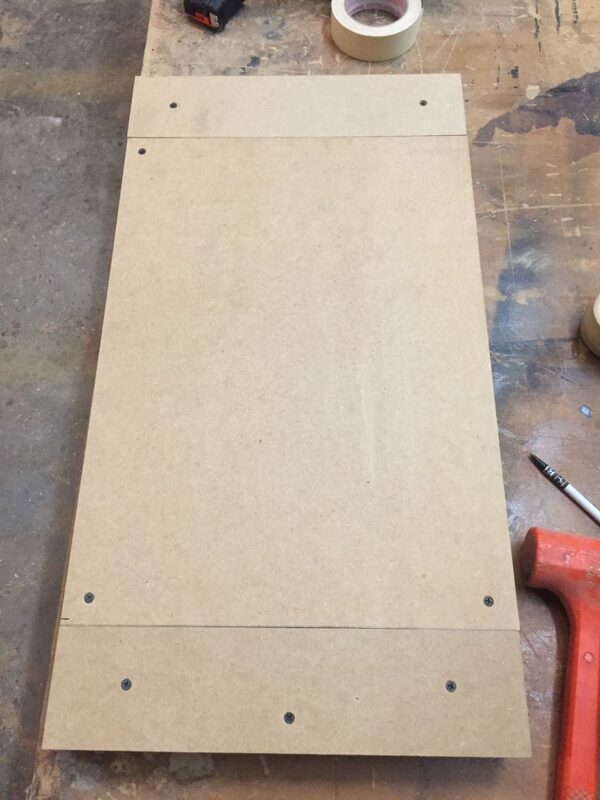 I built the jig out of MDF. Remember this particular project is designed to be 1.5″ Thick, not the usual 1.75″. Adjust your jig to fit your project thickness. This project is designed as a 2-sided carve using only 1 carving bit, so the carving part is pretty simple. It’s going to carve the back of the guitar first, so load your board accordingly into the jig. I use screws to hold down my guitar blank, but make sure they aren’t in a place where there are carvings. Place the jig into the machine and choose your project from the memory card. It will do it’s normal measuring, then ask if the project is in a jig. Answer yes. It will have you locate the left corner of the board as an index point for doing the 2 sided carve. This is part of the “flip within jig” function. Read up on that if you are unfamiliar. Load the Long 1/8″ Carving Bit when prompted and the machine will carve the back side. 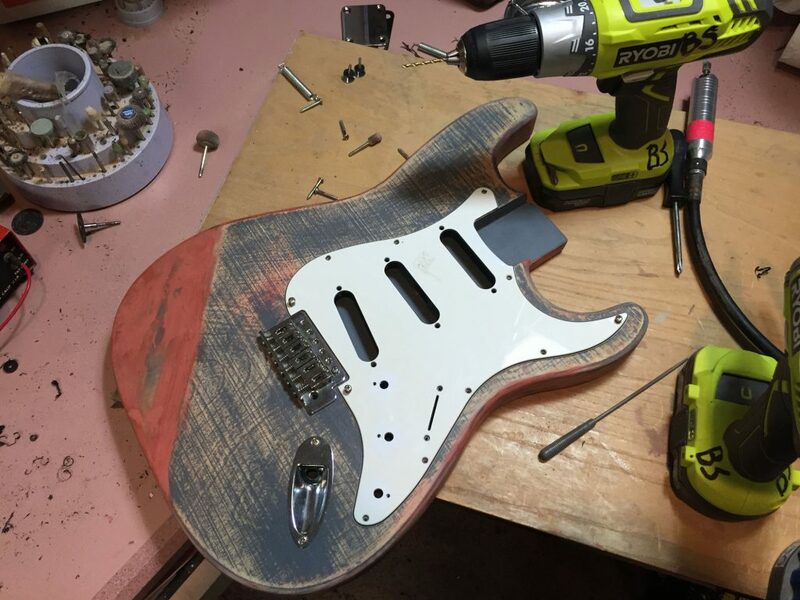 Once, the back is finished, remove the jig and flip the guitar blank, secure it back down with the screws, and reload it into the CarveWright. It will have you locate the right corner now to re-index, and away it carves. RECOMMENDED: Do a test carve first! I test carve almost every big project I do. It takes time, but it can save so much cost and headache if you discover a mistake before it hits your expensive wood. I did a test carve for this project in MDF and found my DXF file’s dimensions were slightly off from the hardware I had purchased. This would have been a disaster had I carved this in an expensive piece of wood to start. I adjusted my file accordingly, and felt confident to do my finished carve. Results of the test carve looked great, but needed some adjustments to the file. It is really important to make sure your blanks and jig are as precise and square as you can get them. This makes a big difference in making sure the front and back line-up. However, if the finished carving doesn’t match perfectly front to back, don’t worry too much. That’s what drum sanders are for. It would be amazing if the guitar could just come out of the machine ready to play, but the reality takes a little more effort. 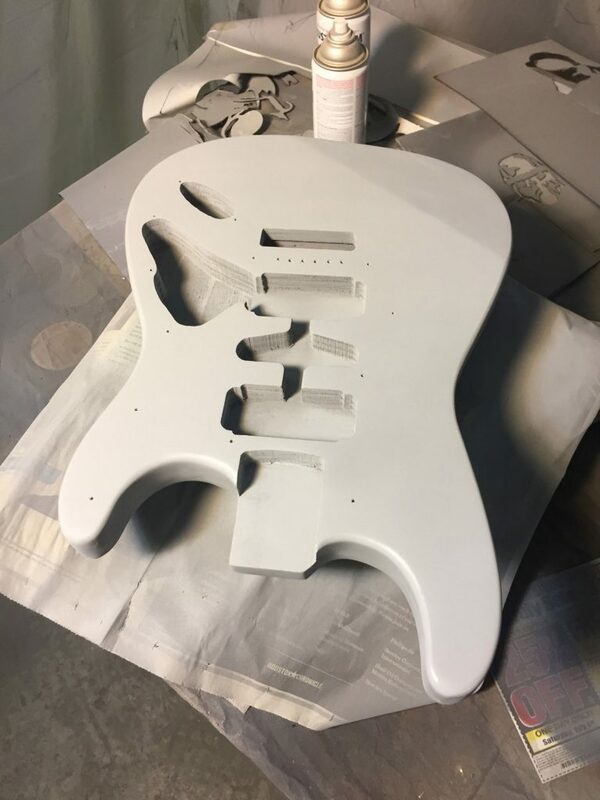 The type of material used will make a huge difference in the amount of sanding work required to get the body ready for finishing. Hard dense woods like maple are much easier to prep for finishing. They may have some machine lines that need to be sanded out, but dense woods carve beautifully. More porous woods like mohagany and oak will require some kind of filler to close all the holes in the woodgrain. 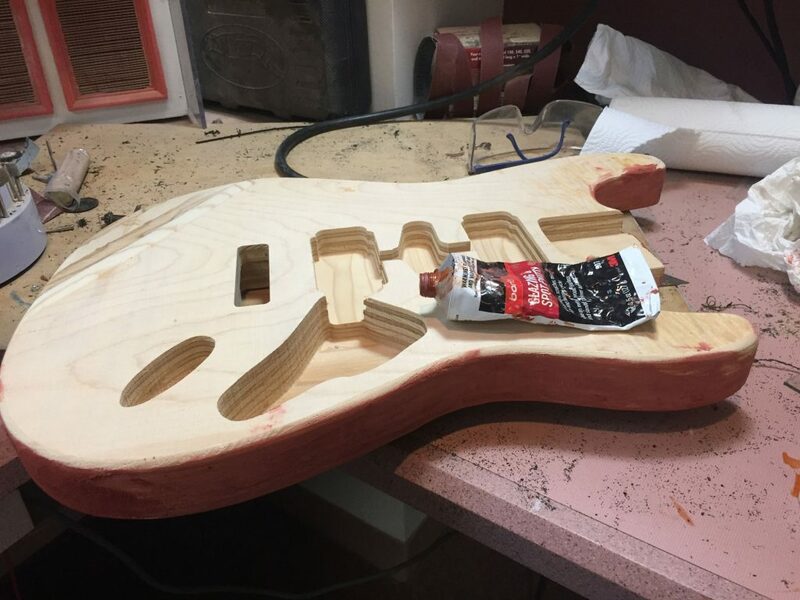 Now, if you do something like carve a guitar out of plywood, then get comfortable and buy extra filler, you’ll be doing it for awhile. 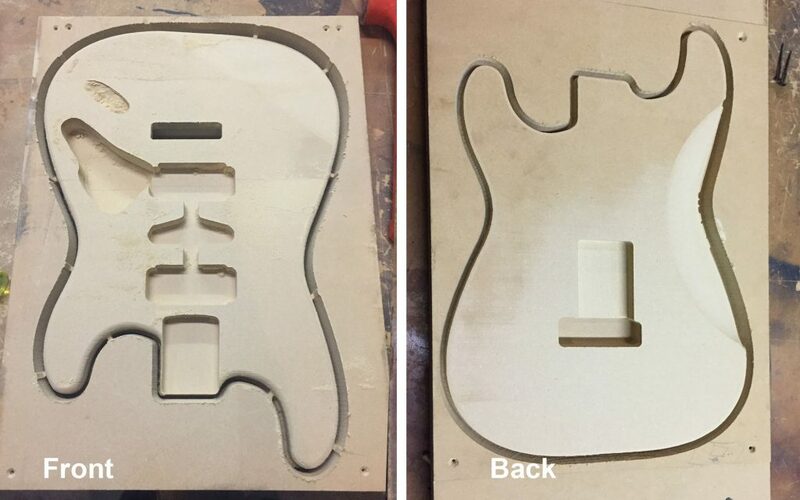 Student-Strat carved and ready for sanding. The first thing I did was sand the edges smooth with my drum sander. This is also where you will smooth any alignment issues with the front and back carves. Then, it was time to start filling with my bondo glazing and spot putty. This filler is my favorite and is really easy to work with. Fill, sand, spray with primer, sand, and repeat until you’ve got it glass smooth. Why did I use plywood again? Next, it was time to make sure everything fits together and drill the mounting holes for all the hardware. I placed the neck and all the hardware in place to verify it all aligned and, in the case of the neck, did some minor fitting work with a file and chisel. The screw holes were marked and pilots holes drilled. I also drilled some wire routing holes where needed. All the holes are drilled, assembly tested for fit, and it’s been smoothed to the point it looks like its cast out of plastic. Time for paint. So smooth! This took a lot of time. 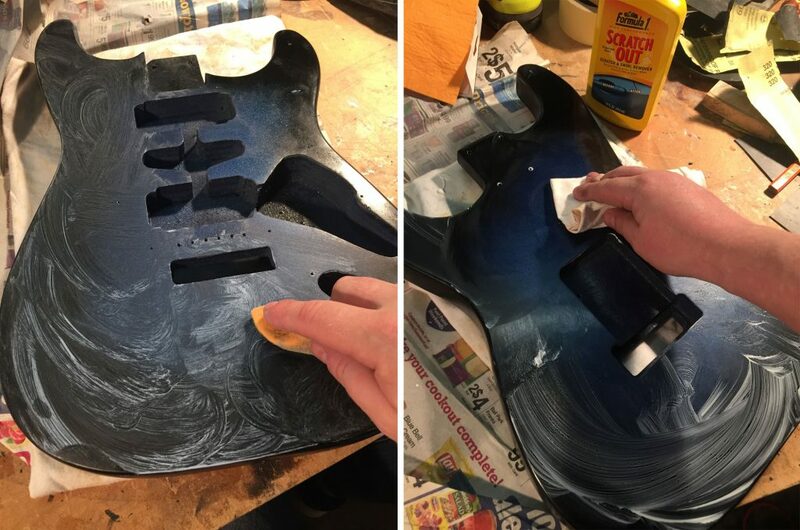 There are so many ways to finish a guitar. Most are painted, oiled, or stained, but I’ve seen some people using fire and even electricity to produce finishes. 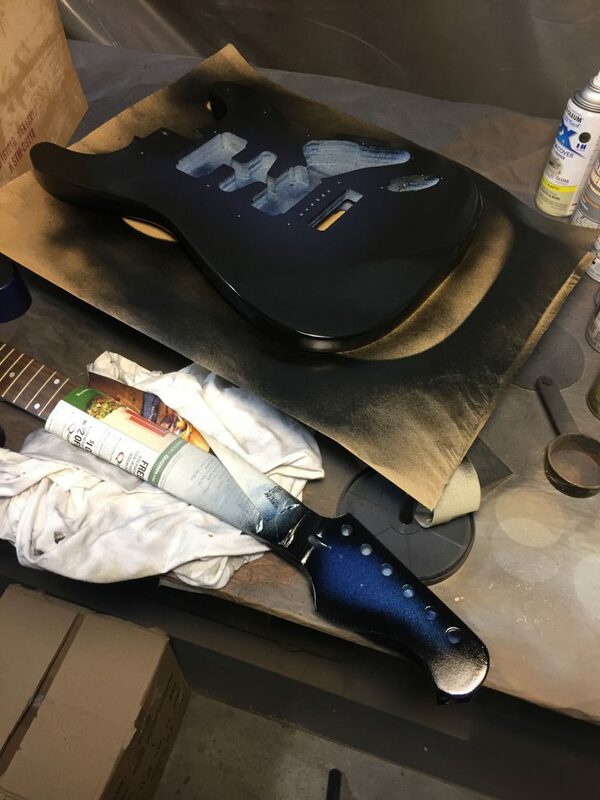 To continue my theme of building a student budget guitar, I wanted to paint it with off the shelf spray paint. I found several great videos online and tried to follow their advise. The number one rule is don’t mix product bases. Meaning, if you are using an enamel paint, use an enamel clear top coat. If you use a lacquer paint, use a lacquer clear coat. Do not mix, as they will not play nice together. If the paint doesn’t clearly state what it is, just buy the clear from the same brand with the same type of label. Second important rule is pay attention to the temperature range the paint can recommends. If it says, don’t use below 50ºF, it really means it. Avoiding these mistakes will literally save you weeks of work. Trust me, I “tested” all of these and they aren’t kidding. I wanted a more interesting finish than just a plain color, so I decided I’d try a “burst” finish. At the local big-box hardware store, I found a metallic blue that looked promising, so I grabbed it, a black for the edges, and some clear top coat. The blue went on first, then after it was dried, I carefully faded in from the edges with the black spray paint. Practice this for awhile before doing it on your guitar. It is not easy. 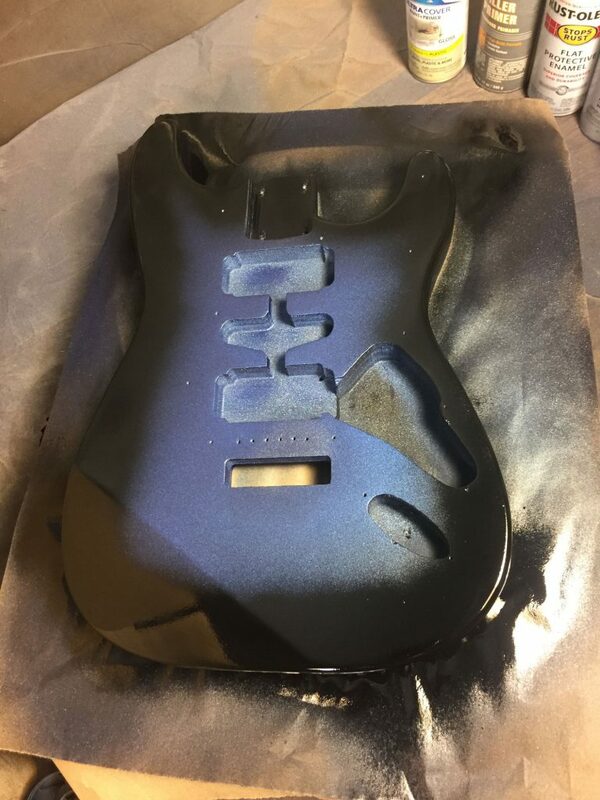 Once fully dry, it should be ready for the clear coat. That is, if you didn’t ignore the directions on the can and spray in your too cold shop making the paint bubble up causing you to have to sand it all back down and start over. Of course you didn’t, who would do that? Read the instructions for the clear coat you are using. For lacquers, you want to really flood the piece to build up nice thick layers. It self levels nicely and is very forgiving. Remember though, you will need to have painted the rest of the piece with lacquer to use a lacquer clear coat. If you’ve used a typical spray paint, it’s probably an acrylic enamel, so you will need the corresponding clear coat product. These clears are applied more like paint with multiple thin coats. It will get thick faster than you expect. 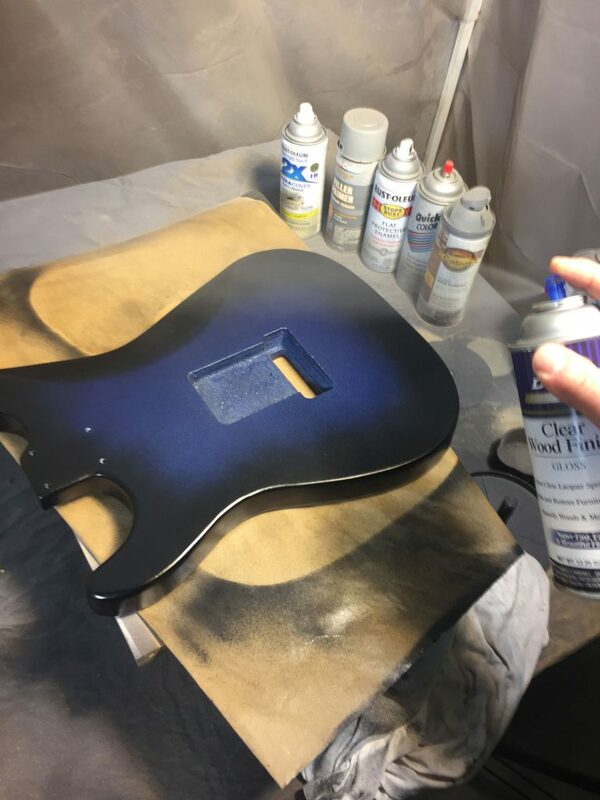 I would sand after every third coat, or so, using a wet sandpaper starting at around 400 grit, working my way up to 1200 grit, and finishing with some car polish in the end. There are great how-to videos on Youtube for finishing to a high gloss shine. I watched dozens, and I recommend you do the same. Don’t stop until it looks like glass! Once the finish is shiny and polished enough you can see your reflection in it, it’s time for the final assembly and strings. Let’s see how she sounds. 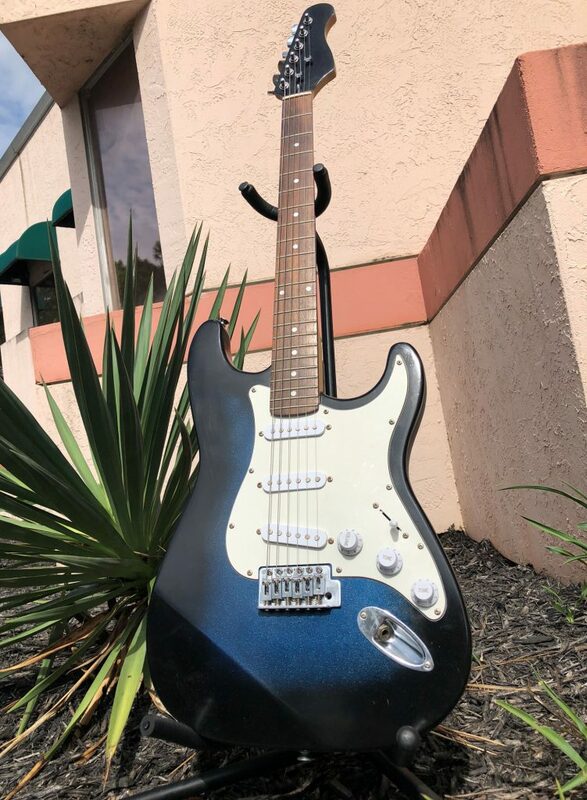 In the end, this guitar was made for around $175. I could just go buy a cheap guitar for that, but it wouldn’t mean as much to me. This is a guitar I made myself and that is priceless. 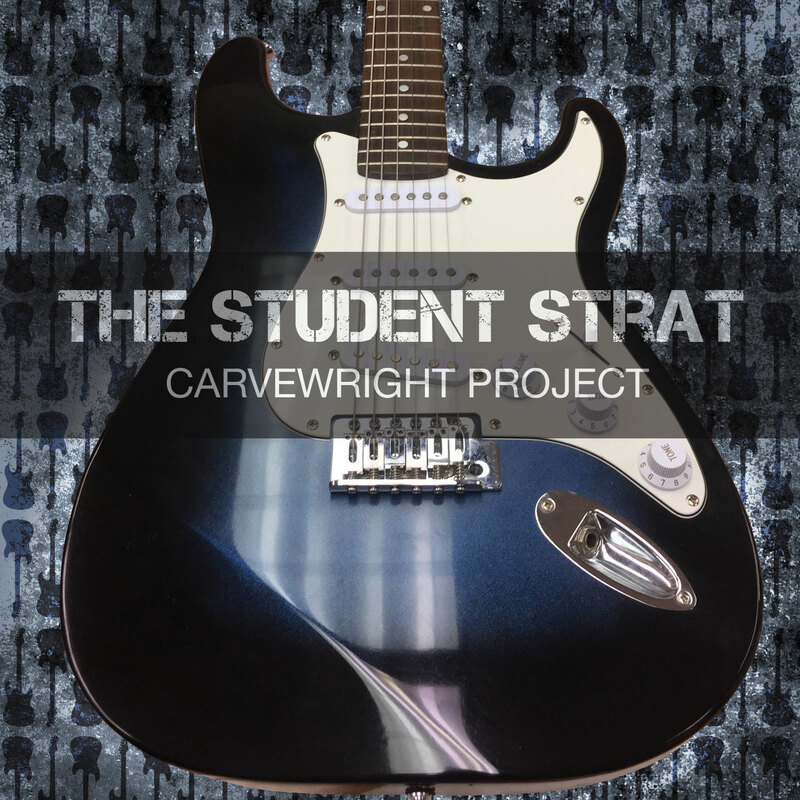 You can purchase the CarveWright MPC files for the Student-Strat at the CarveWright PatternDepot. This entry was published on September 28, 2018 / Joe Lovchik. Posted in The CarveWright Build Blog. Bookmark the permalink. Certainly an impressive project!!! Enjoyed this blog! Thinking about building one! After all I am only 79 yrs. old! Fantastic article and how-to! Very impressive results, Joe!